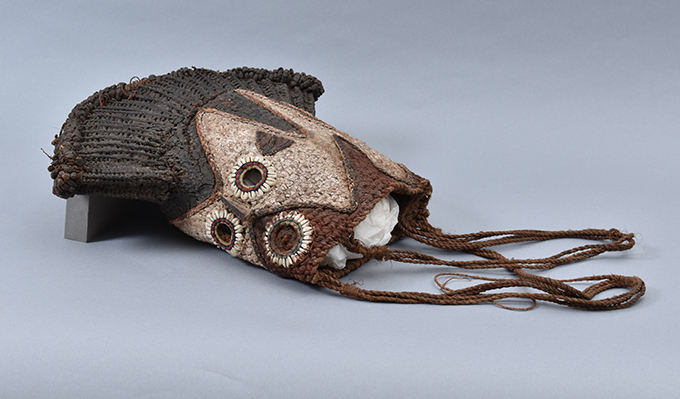 A video introducing some of the work we have been pursuing in the University of Cambridge Museum of Archaeology and Anthropology stores by George Emeka Agbo, the project’s postdoctoral research fellow. 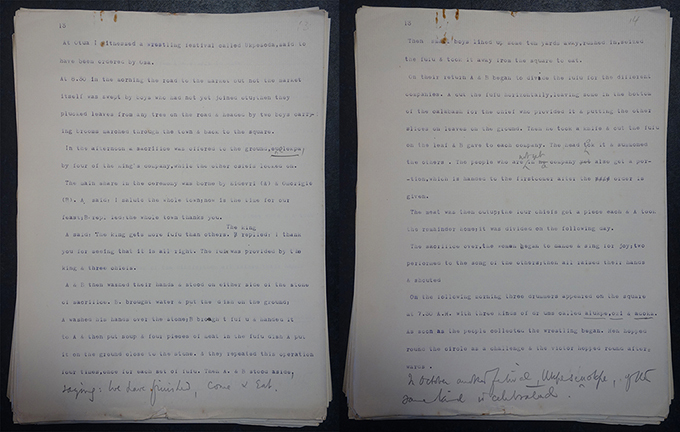 Excerpt from N. W. Thomas’s typed-up notes describing Otuo’s ‘Ukpesoda’ wrestling festival, 12-13 July 1909. 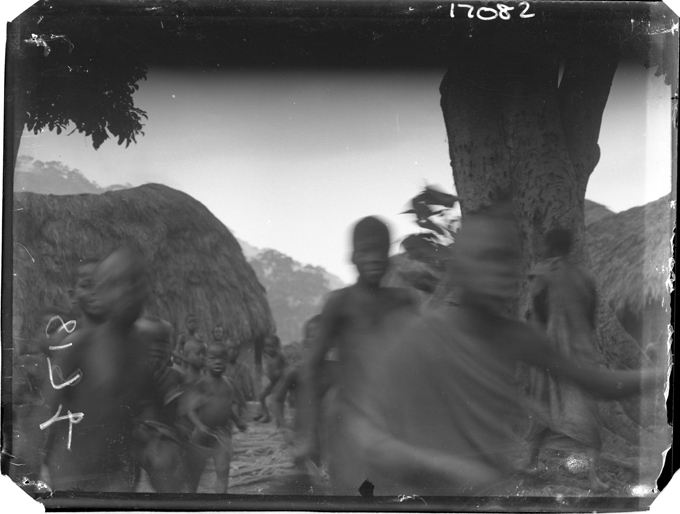 The first phase of the [Re:]Entanglements project has been focusing on researching the archives and collections assembled during Northcote Thomas’s anthropological surveys in Southern Nigeria and Sierra Leone. 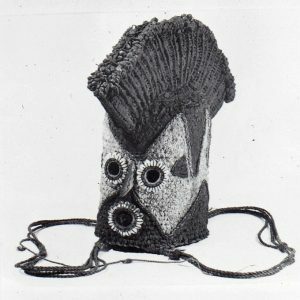 After the surveys, the collections were dispersed and they are now scattered across many institutions, including the University of Cambridge Museum of Archaeology and Anthropology, the Royal Anthropological Institute, the British Library Sound Archive, the UK National Archives, and National Museum, Lagos. One of the exciting aspects of this research is to reassemble the disassembled documents, photographs, sound recordings and artefacts relating to a particular event that N. W. Thomas documented. 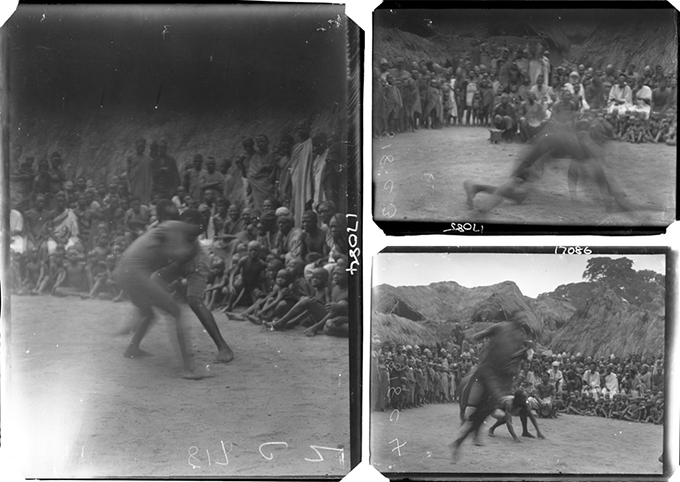 Here, for example, we bring together photographs, sound recordings and an object that can be associated with an account of a wrestling festival that Thomas attended on 12-13 July 1909 in the North Edo town of Otuo (spelled Otua by Thomas). 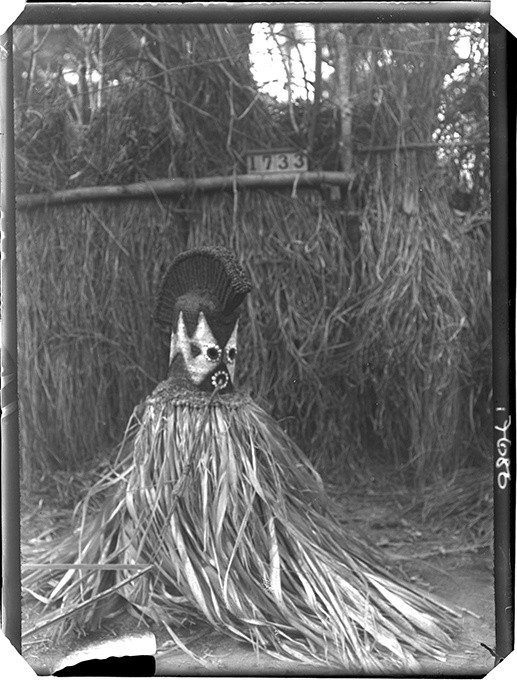 This written account was found in a bundle of typed up notes from his first tour, perhaps fragments of an early draft of his Anthropological Report on the Edo-speaking Peoples of Nigeria. 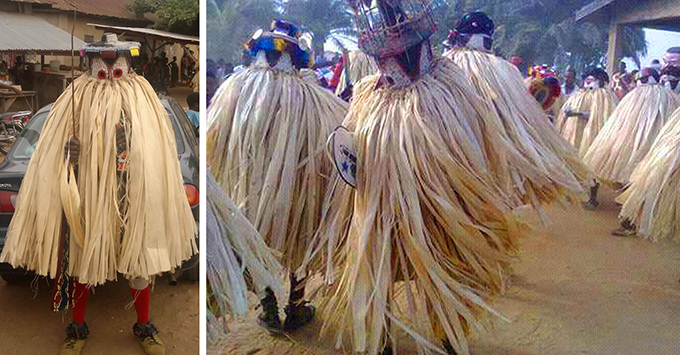 At Otua I witnessed a wrestling festival called Ukpesoda, said to have been ordered by Osa. At 8.30 in the morning the road to the market but not the market itself was swept by boys who had not yet joined otu [an age-set]; then they plucked leaves from any tree on the road & headed by two boys carrying brooms marched through the town & back to the square. Uninitiated children sweeping the road to the market before the start of the festival, Otuo. NWT 817b, RAI 400.17082. In the afternoon a sacrifice was offered to the ground, euelekpa, by four of the king’s company, while the other chiefs looked on. The main share in the ceremony was borne by Eidevri (A) & Omorigie (B). A said: I salute the whole town; now is the time for our feast; B replied: the whole town thanks you. A said: The king gets more fufu than others. The king replied: I thank you for seeing that it is all right. The fufu was provided by the king & three chiefs. 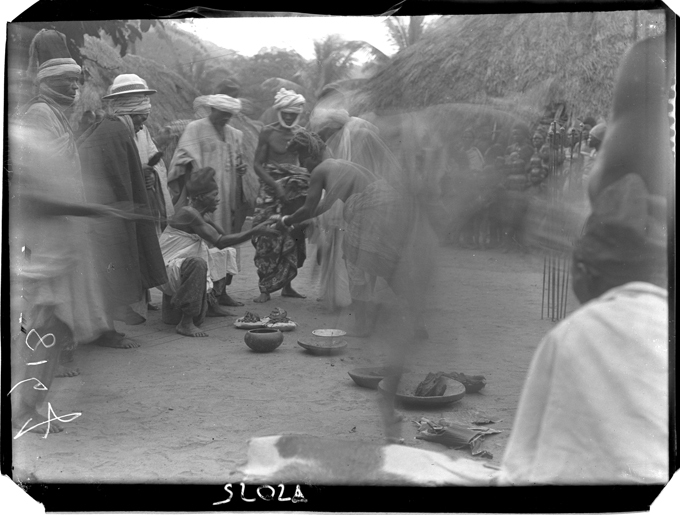 Distributing sacrificed fufu and meat to the king and chiefs on the first day of the festival, Otuo. NWT 816f, RAI 400.17075. A & B then washed their hands & stood on either side of the stone of sacrifice. B brought water & put the dish on the ground; A washed his hands over the stone; B brought fufu & handed it to A & then put soup & four pieces of meat in the fufu dish. A put it on the ground close to the stone & they repeated this operation four times, once for each set of fufu. Then A & B stood aside, saying: We have finished, come & eat. Then small boys lined up some ten yards away, rushed in, seized the fufu & took it away from the square to eat. On their return A & B began to divide the fufu for the different companies. A cut the fufu horizontally, leaving some in the bottom of the calabash for the chief who provided it & putting the other slices on leaves on the ground. Then he took a knife & cut the fufu on the leaf & B gave to each company. The head took it & summoned the others. The people who are not yet in a company also get a portion, which is handed to the firstcomer after the order is given. The meat was then cut up; the four chiefs got a piece each & A took the remainder home; it was divided on the following day. The sacrifice over, the women began to dance & sing for joy; two performed to the song of the others; then all raised their hands & shouted. Women singing on the first day of the festival, Otuo. NWT 816l, RAI 400.17080. 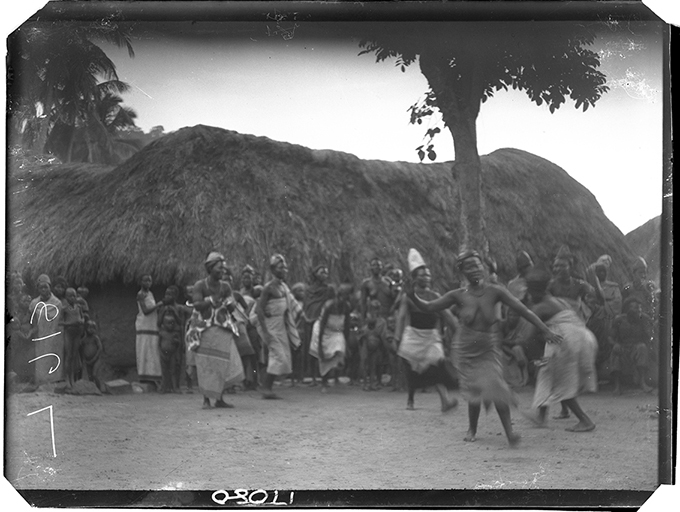 ‘Otua women’s song, July 13th 1909’. NWT 169, BL C51/2449. On the following morning three drummers appeared on the square at 7.30 AM with three kinds of drums called alukpe, ozi & adoka. Drummers playing on the second day of the festival, Otuo. NWT 817a, RAI 400.17081. 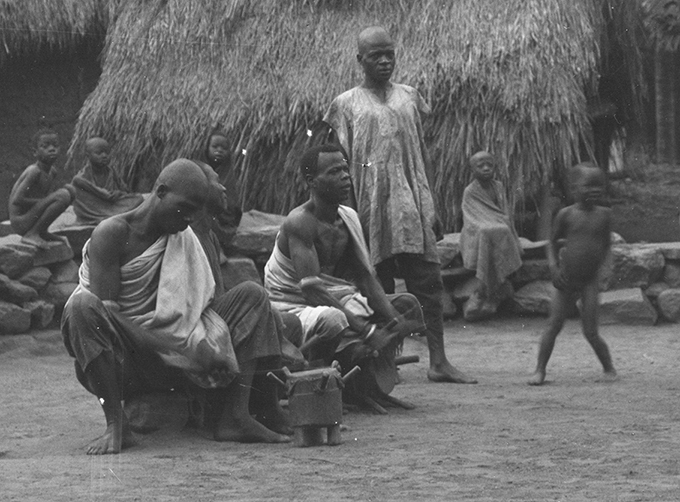 Drumming recorded by N. W. Thomas in Otuo, July 1909. NWT 156, BL C51/2268. As soon as the people collected the wrestling began. Men hopped round the circle as a challenge & the victor hopped around afterwards. 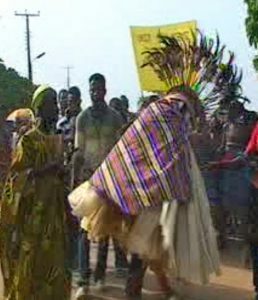 Wrestling scenes during the second day of the festival, Otuo. NWT 818c2, RAI 400.17084; NWT 818c3, RAI 400.17085; NWT 818c4, RAI 400.17086. The drummers took up their sticks again and the air shivered and grew tense like a tightened bow … The wrestlers were now almost still in each other’s grip. The muscles on their arms and their thighs and on their backs stood out and twitched. It looked like an equal match. The two judges were already moving forward to separate them when Ikezue, now desperate, went down quickly on one knee in an attempt to fling his man backwards over his head. It was a sad miscalculation. Quick as the lightning of Amadiora, Okafo raised his right leg and swung it over his rival’s head. The crowd burst into a thunderous roar. Okafo was swept off his feet by his supporters and carried home shoulder-high. They sang his praise and the young women clapped their hands. Since the N. W. Thomas collections are in different physical locations, it is only through digital technology that we can bring them together in one space, reuniting sound, image and object. Bringing together these materials seems simple enough, but actually involves painstaking archival and collections-based research. Each institution has accessioned these materials using its own numbering system, and it has been necessary to reunite them using Thomas’s own original numbering systems, relying on the scratched numbers on the edges of photographic negatives, Thomas’s spoken ident at the beginning of sound tracks, and associating Thomas’s collection numbers with his object catalogues. This is further complicated by the fact that there is no straight-forward documentation of Thomas’s itineraries, recording what he did where, and what he collected, photographed and recorded. 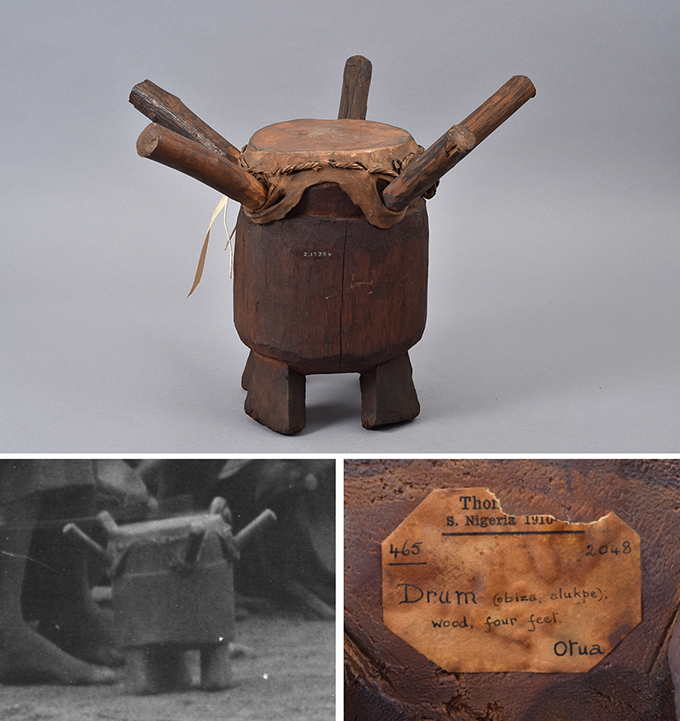 ‘Alukpe’ drum collected by N. W. Thomas in Otuo in 1909. If this is not the actual drum in the photographs of the wrestling festival, it is very similar. NWT 2048, MAA Z 13384.